Over the past few days at LSI’s AIS 2012, a number of LSI partners had a chance to show off their newest lineup of products and among the more consumer / enthusiast oriented companies is PNY. 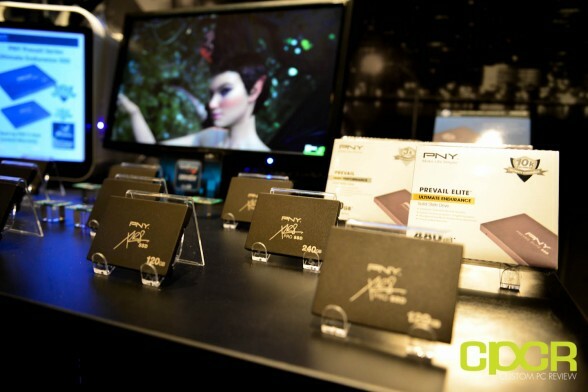 For the few who are unfamiliar with PNY, they are a USA based company who produces a wide variety of products ranging from stuff like SD cards and headphones to SSDs and graphics cards. 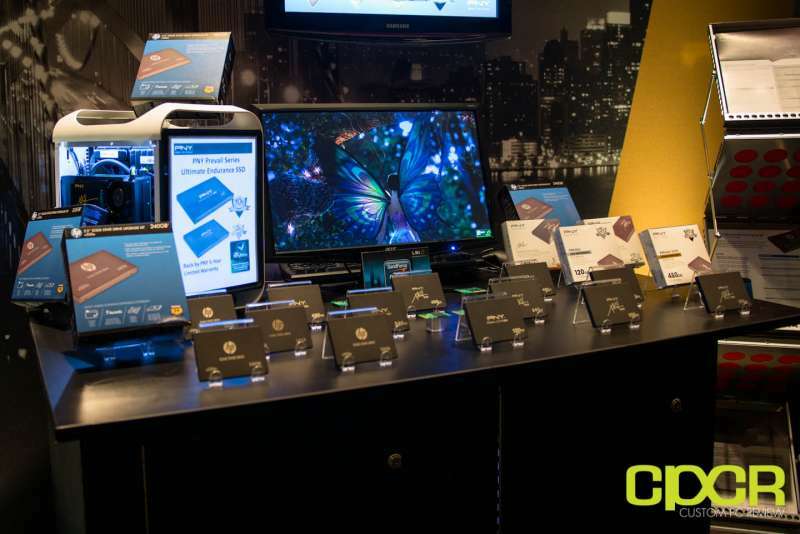 During their showcase at LSI’s AIS, we had a chance to look at their entire line up of SSDs including their XLR8 and Prevail series products as well as a first look at their recently announced HP branded SSDs. 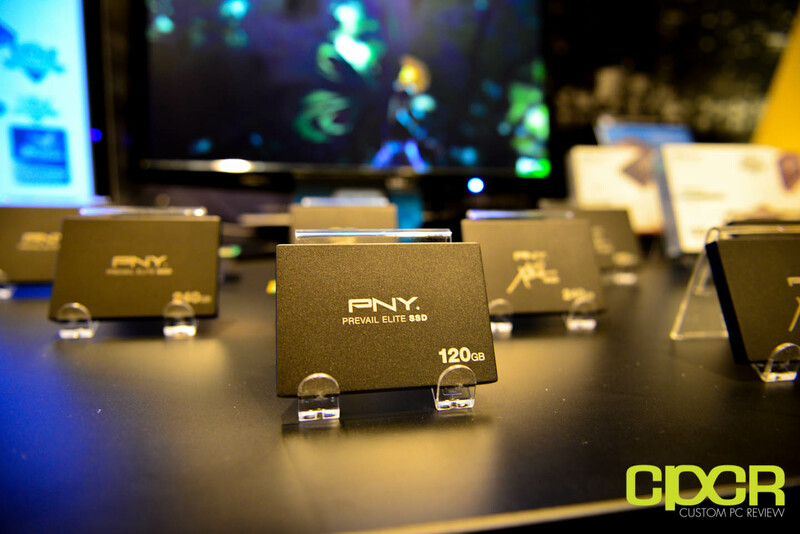 The XLR8 line is PNY’s entry level offering for general consumers and uses a SandForce SF-2281 controller, 3K P/E Synchronous MLC NAND, and is capable of achieving 500MB/s sequential reads and 475 MB/s sequential writes. The XLR8 Pro line on the other hand is more geared towards gamers / enthusiasts and while it also uses the SandForce SF-2281 controller along with 3K P/E Synchronous NAND, it can achieve up to faster sequential reads and writes of up to 550 MB/s and 520 MB/s respectively. The Prevail series in general is geared more towards enthusiast / workstation applications and uses the SandForce SF-2281 controller paired with 3K P/E MLC Synchronous NAND. It’s capable of reaching sequential read and write speeds of up to 550 MB/s and 520 MB/s respectively. The Prevail Elite series like the Prevail series is targeted more towards enthusiast / workstation / enterprise applications and uses the same SandForce SF-2281 controller; however, what’s special about the Prevail Elite series is that it uses 10K P/E eMLC NAND, which provides additional durability for those who need a higher endurance SSD. As far as I know, the Prevail Elite is one of the only if not the only SSDs on the market to use 10K P/E eMLC (Enterprise Multi Level Cell) NAND. 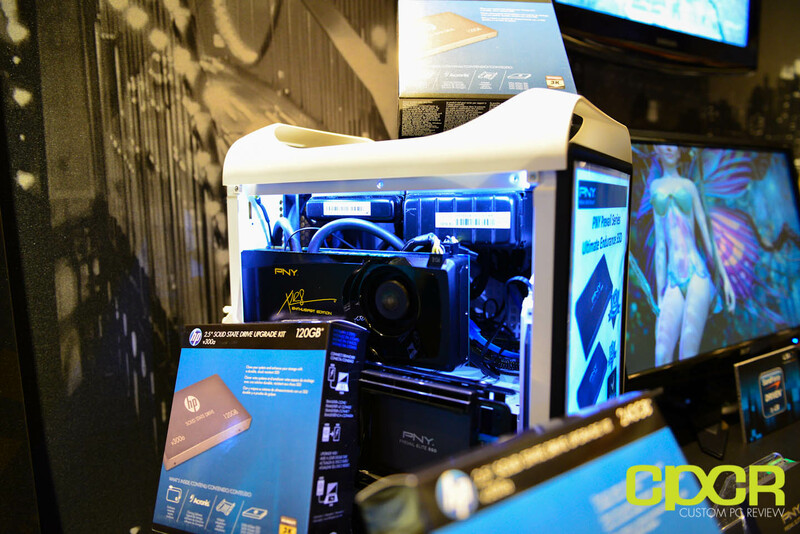 In terms of performance, it’s capable of reaching sequential read and write speeds of up to 550 MB/s and 520 MB/s respectively. 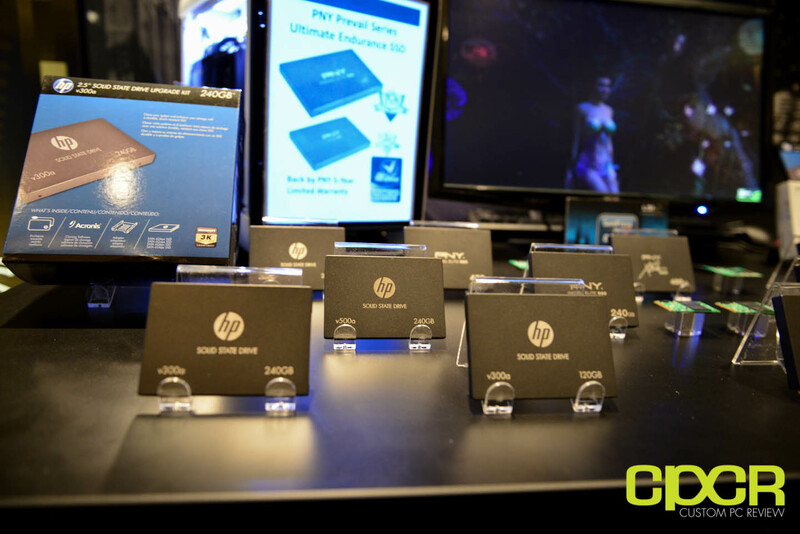 PNY also had a couple of their newest SSDs, which are HP branded SSDs designed for better compatibility with HP desktops and notebooks. Among the products on display is the HP/PNY v300a and HP/PNY v500a SSDs, both capable of up to 550MB/s sequential reads and 520MB/s sequential writes. While both offer SATA 3 6Gb/s saturating performance, the v300a offers the more typical 3K P/E Synchronous NAND whereas the v500a offers higher endurance 5K P/E Synchronous NAND. Both the v300a and the v500a are currently available at your favorite retailers and will come in the usual capacities of 120GB, 240GB, and 480GB. The v300a will come with a standard 3 year warranty while the v500a will come with an extended 5 year warranty. One thing that distinguishes PNY’s SSDs is that most of their SSDs offer an industry leading 5 year warranty upon registration of the product. 5 year warranties are generally only seen from a small handful although growing list of manufacturers and speaks volumes about a company’s faith in their products. how is the HP v300 vs samsung pro? Not sure. I’ve never tested the v300; however, it’s a SandForce based drive, so it should perform quite similarly to other SandForce based drives.